One of the challenges that cyclists and pedestrians deal with is the wide variety of road hazards they encounter. If you see a road hazard, report it using our online hazard report form. Can I take one with me? Wallet size business cards are available that include a link so that you can always carry the online hazard report with you. Contact us to request your own Hazard Report Cards. Any road or sidewalk hazard that endangers or inconveniences cyclists; Potholes, glass in bike lanes, overgrown bushes, damaged sidewalks, nonfunctioning crossing buttons, etc. Your report is forwarded to the responsible Public Works agency. A representative from the agency may call or email you for more information. Public works will look in to the hazard and decide how to address it. Be careful. Maintain your awareness when cycling, and look ahead so that you have time to avoid any hazards you see in your path. Maintain your own property. 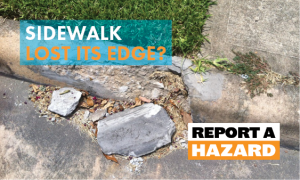 Remember that property owners are responsible for adjacent sidewalks, so if the sidewalk in front of your house is unsafe, you will be responsible to fix the problem. The Hazard Report Form is also available in a printable version. Once completed, mail or fax to the RTC.